ES broke declining resistance overnight and we may be seeing the start of a move to test the highs, very possibly to make a double or M top for the retracement that I am expecting to see. The main alternate scenario is that the retracement low is now in and we are seeing the start of a new wave up and that's possible, but I'm leaning strongly against that at the moment. Will that channel hold though? 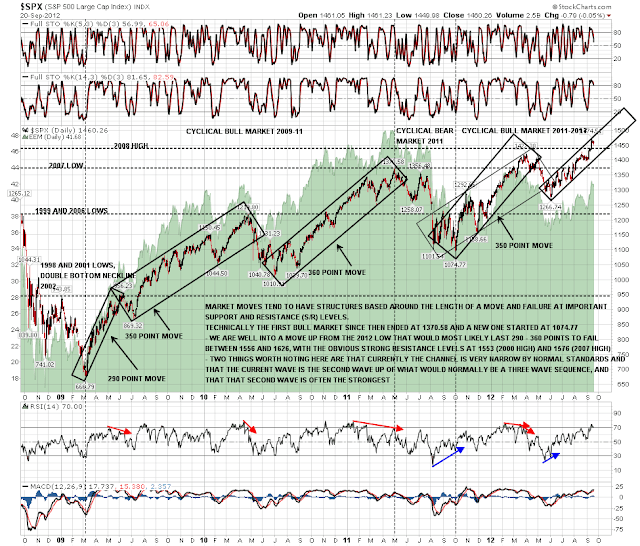 Looking at my chart of the moves up since the 2009 low the angle of the channel a bit steeper than the drives into the 2010 and 2011 highs and shallower than the drive into the 2012 high. It's worth noting though that the drive into the 2012 high though is probably better viewed excluding the October low, in which case it was exactly as steep as, and slightly shorter than, the move into the 2011 high. I've added that box onto the chart as an alternate. 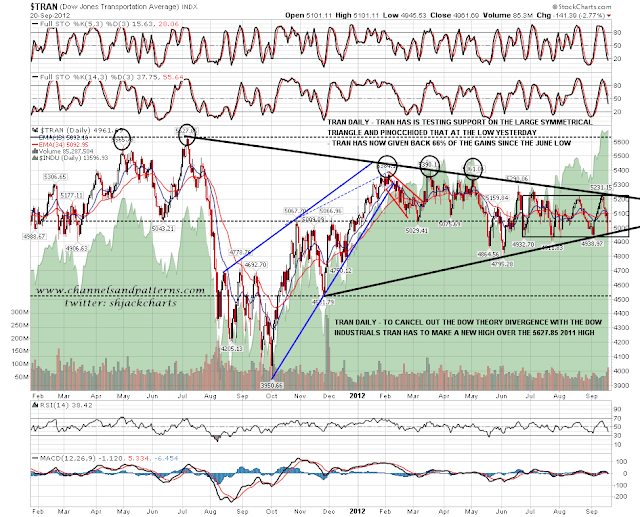 That brings me onto the Dow Theory (DT) musings today. 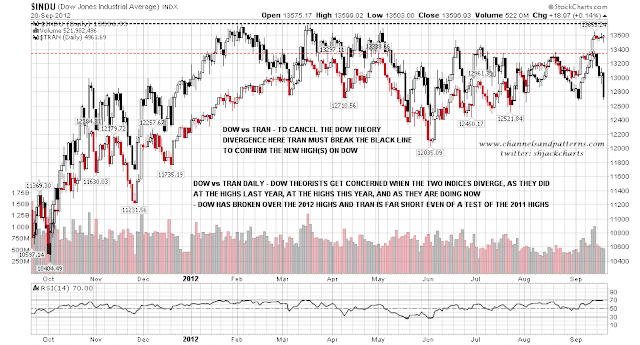 Now there are strong DT divergences here between Dow and TRAN. Dow has broken over the 2012 high and is within striking distance of the 2007 high. TRAN actually made all time highs in 2011, so a new all time high on Dow would end the first DT divergence and confirm that 2011 all time high on TRAN. Since that 2011 TRAN high however TRAN has seriously underperformed Dow, and is currently well short of even a new 2012 high, and further short still of that 2011 high. What is this telling us? The idea behind this is that when TRAN outperforms Dow the real economy (consumption requiring transport) is outperforming the stock market, and when Dow outperforms TRAN that the stock market is outperforming the real economy. 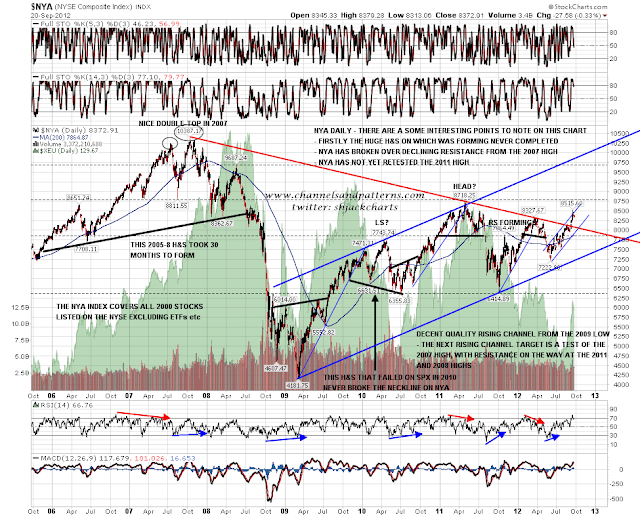 What the current divergence since the 2011 TRAN high is telling us therefore is that the stock market is outperforming the real economy by a wide margin, and looking around at various economic indicators that is obviously right. Does it still matter though? 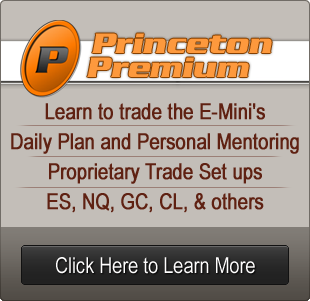 There has never been a period since Dow Theory was formulated in the 1920s and 1930s when stock market has been openly supported by the US government, but we are now in such a period, with the stated intention by the Fed that they want to boost asset prices including equity markets in the hope that will drag the real economy up with those. It seems unlikely that the real economy will be boosted much by higher asset prices, and may instead be seriously hurt if commodities, particularly oil, take off again in a big way in response to QE3, but we have to consider that QE3 may drive asset prices much higher regardless. Here's the Dow vs Transports chart from the 2011 lows, with a particularly stark underperformance from TRAN in recent days. I've been mentioning a possible retest of the SPX highs all week, and today is the most likely day to see that happen. If we were to see the current high break I'd be looking for strong resistance in the 1480-5 area, and if the current rising channel on SPX is going to hold, then the high from this current move would start the main body of the retracement within that channel. 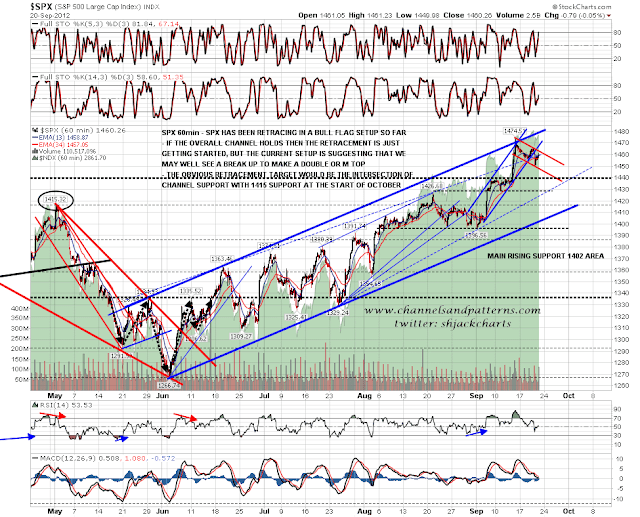 There is a possibility that the channel will break up however and that needs to be borne in mind. Apologies for being a bit wishy-washy on this, but we are in a transition period at the start of QE3, and we don't yet know how powerful the Fed boosting effect is going to be with equities already so high and the growing divergence between equities and the real economy. I'm expecting channel resistance to hold, but I could be mistaken.